The PDF format supports two types of text objects: simple text objects and formatted text objects. For the former one, please refer to this section. Unlike simple text, formatted text can use formatting, styles and alignment. To insert a formatted text object to the page, click the Insert Formatted Text button on the toolbar or use the Insert > Formatted Text menu or press Ctrl+T, then click a place on the page where you want this text object to be and type the text. Click anywhere outside the edit box or press Esc to finish editing. 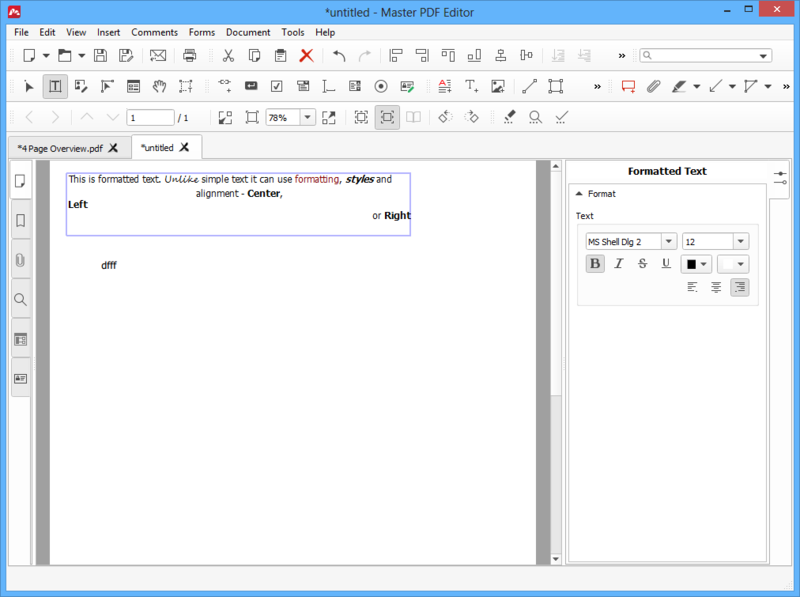 To edit a formatted text in the PDF document, select the formatted text object using the Edit Document tool or the Edit Text tool. Then double-click the formatted text object you want to modify. Now you can edit the text of the object. For instance, you can change font style, color or family of selected parts of the text, and align text lines using the Align Left, Align Center and Align Right buttons. A formatted text object can be moved to another place just like any other PDF object. You can read how to move objects in this section. You cannot directly resize the formatted text object, because the size of the object depends on the text content. You can align a formatted text object using the Align command on the toolbar or in the Edit menu. Please read more about aligning objects in this section. Choose the Select Text tool on the toolbar or in the Tools menu (Alt+7). The mouse cursor will change to a crosshair. Right-click and select Copy in the context menu or press Ctrl+C. Then, you can paste this text wherever you want. NOTE: This will only copy text, not its formatting or the formatted text objects themselves. Copying and pasting objects is described here. If you want to paste a text copied from another source to a PDF page, you should insert a text object or a formatted text object in the document and then paste the text from the clipboard to the edit box.